Azamara Club Cruises consist of three intimate ships, Azamara Journey, Azamara Quest and Azamara Pursuit, which entered the fleet in August 2018. Each can carry 702 fortunate guests and because they are smaller and sleeker than larger cruise ships, they can sail to ports that others simply cannot reach. You may be wondering where the name Azamara comes from. 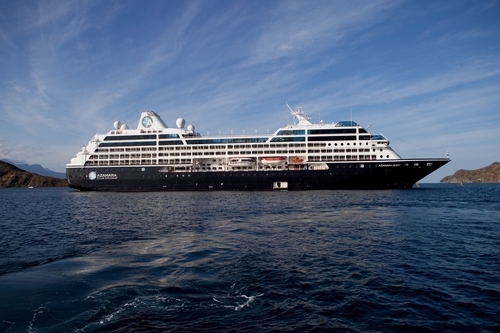 Azamara is a coined term derived from the Romance languages. This includes the more obvious links to blue (az) and the sea (mar). The name was also inspired by a star, Acamar. In Classical times, the star Acamar was the most southerly bright star that could be seen from the latitude of Greece. Azamara Club Cruises can be seen as a star on the blue sea. Experience the world’s wonders from your Azamara hotel at sea. After a day or night spent immersed in your destinations, you’ll have a club-like ship to come back to. Azamara is excited to introduce the next level of immersive experiential travel. This new collection of excursions and activities will take you deeper into the heart of local life with exclusive events and activities, all focused around immersing you in the arts, culture, history, and natural beauty of your destinations. Make mozzarella by hand with the Italian pros. Play the world's finest courses. Enjoy an overnight desert experience or savor a feast for the senses at local markets with one of our chefs. These land programs bring you authentic experiences which enable you explore, dine and live like a local. By spending more time in ports and on overnight stays than most other cruise lines, you can fully immerse yourself in the culture, cuisine and people of your destinations. Re-imagined staterooms include modern amenities, furnishings, and European linens. Plus the ship features a large number of staterooms and suites with balconies, perfect for starting your day with fresh sea air and stunning views. Add to all of that world-class dining options, spa experiences to relax and refresh, and all-new entertainment offerings, you’ve got an on-board experience that’s matched only by the immersive cultural encounters we’ve got in store on shore.